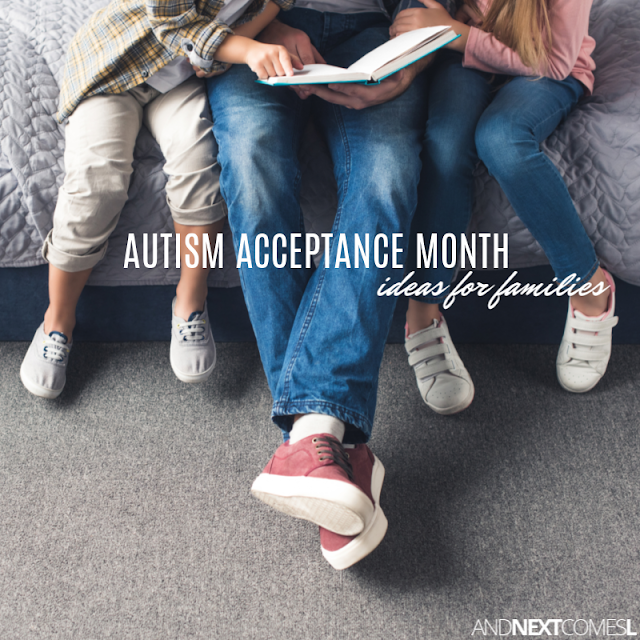 Autism acceptance month ideas for families and how you can participate in autism acceptance month with your family. In case you didn't already know it, April is Autism Acceptance Month. And there are lots of things you can do as a family to educate yourself and teach your children about autism and neurodiversity. Because even if you don't know an autistic person yourself (although you likely do), you likely have an autistic co-worker. And there's likely an autistic child in your child's classroom or school. They deserve to be accepted and embraced for who they are, just like every other human being on this planet. So this April, I encourage you and your family to move beyond autism awareness by learning more about autism and neurodiversity. 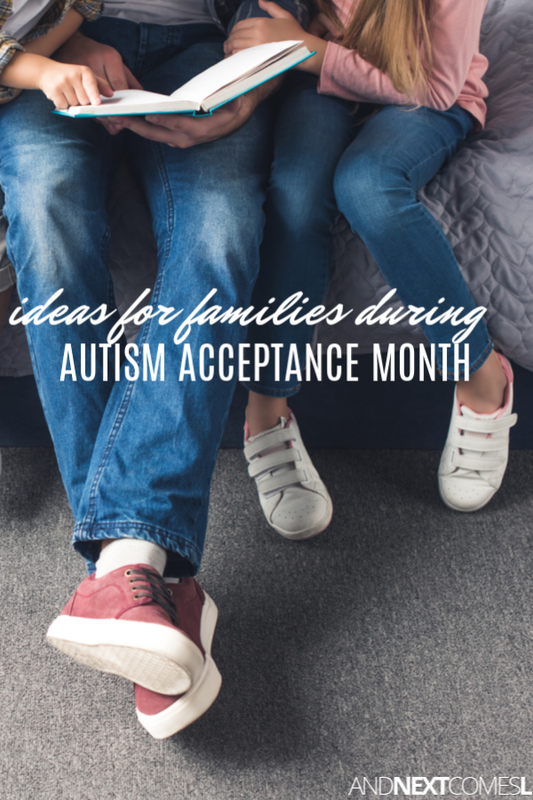 Here are some things you can do with your family during autism acceptance month. 1. Read picture books about autism with your child. 2. Talk to your kids about autism and disabilities and explain that not all disabilities are visible. 3. Learn more about autism by reading a book about autism. My top picks for someone new to autism and neurodiversity would be Uniquely Human or The Reason I Jump, but if you are ready to dive into something more meaty, I highly recommend Neurotribes. 4. Join an autistic-led group and start listening to and learning from autistic people themselves. 5. Read a book that features an autistic main character or read one out loud together as a family. 6. Educate yourself about these common autism myths. 7. Donate an autism picture book to your child's classroom so that it can be shared with lots of children. 8. Learn about neurodiversity. This calendar of neurodiversity resources from The Neurodivergent Teacher is a fantastic starting point. 9. Start reading blogs and sharing articles and content written by actually autistic people. For example, you could start watching and sharing some of these Ask an Autistic videos. 10. Read up about identity-first language and start getting comfortable using the word autistic. This article called The Significance of Semantics: Person-First Language: Why it Matters from Autistic Hoya is a great read!